This week, I ponder on the question of Church and especially those that claim to be on "maintenance mode." I want to argue that "maintenance mode" churches are actually churches on life-support, not maintenance. In "Mourning the Death of a Church," the writer Angie Mabry-Nauta began with a grim picture of the American Church scene where nine churches close down daily. Her church was one of them. In fact, one of the comments in the article disturbed me. That person said: "Can't we figure out a way to save our church?" It makes me wonder theologically. Is it not the Church who will be the vehicle to share the message of salvation? If the Church herself needs saving, what hope will there be for others who need to hear the gospel? Mabry-Nauta then compared the dying of the church to the dying of an individual, asking the same kind of questions pertaining to death and dying. How does one desire to die? What is the quality of death? What does it mean to call it quits? It was a tough and emotional struggle for her and for her church that decided to shut down. Many churches are already on life-support. An ex-pastor in New England once told me about his painful decision to shut down his church plant after about five years. It was not an easy decision. The numbers did not add up. How can anyone justify investment in real estate or salary for ministry when there are so few people in the church? The pastor even needed to work elsewhere to pay for his own expenses. When the financials do not make sense, invariably the next decision is to close down the church. Not too long ago near my Church neighbourhood, there was a Church that also shut down, donated her building to another congregation, and liquidated the rest of her assets. South Hill Church was in existence for more than 60 years, planting many other churches along the way, including the very famous Willingdon Church in Burnaby. On June 16th, 2013, South-Hill Church was history. Not without blessing others with what she had. In death, she has given life to others. 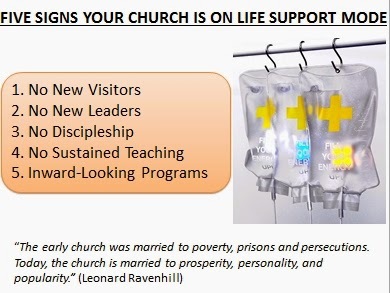 The key question I have this week is this: How do you know if your church is on life support? I suppose most people would like to reply in the negative, saying "Nope. We are surviving." Such churches are in survival mode, or "maintenance mode." They are contented with mere Sunday services, familiar small groups, regular comfort level activities through the week, and whatever activities to help maintain their status quo. Let me share five signs to check whether your church is on "maintenance mode." In some churches, during announcements time, there would be a phrase that says, "Is there anyone here with us for the first time?" Occasionally, there will be a few. Most of the time, the congregation members will just look around, bemused, with some wondering why the announcer is not moving quick enough to the next item on the program. When churches are without new visitors, the numbers in the Church can never grow. Members simply go through the motions, see familiar faces and say hello before the service, and wave goodbye after the service. They do not even invite their own friends, for whatever reasons. Even churches in Asia despite their numbers are not immune to this. So much so that pastors continue to remind their members to bring friends. Come to think of it, one way leaders can do to stay in power is to put a bar so high that others cannot reach. Without new leaders, the old gets tired and their longevity becomes engraved into the image of the Church. Another challenge in any church is the lack of discipleship. The lack of mission and evangelism is also embarrassing, considering the fact that one of the major purposes of the Church is to be God's vehicle for mission. Sadly, churches have outreach often in their mission statements, but their very actions and focus on their own programs betray that statement. Some churches even organize holiday trips, golf games, social outings without much intention to spread the gospel at all! I think Frank Laubach's reminder here is very apt. "The simple program of Christ for winning the whole world is to make each person He touches magnetic enough with love to draw others." Discipleship, mission, evangelism, a passion for souls are all factors to help make us all more "magnetic." When this happens, no longer are we merely concerned about evangelistic programs or occasional outreaches. Our whole lives become opportunities to spread the gospel. The rest of the time, we are under intensive training. Eddie Gibbs reminds us of the importance of teaching in the Church. One such teaching is that "fellowship" is not just about social gatherings. It is about becoming more like Christ. It is encouraging one another on to good works, just like Christ. It is pushing one another to be more Christlike each day. Gibbs reminds us too that "fellowship" is essentially an outcome of "followership." Who are we following? We follow Christ. Who are we imitating? We are imitating the Triune God who is perfectly and eternally in fellowship with one another: Father, Son, Holy Spirit. Who are we imitating then? We are imitating God, to grow in our knowledge of God's Will, in the Name of Jesus Christ his Son, with the Power of the Holy Spirit. This is essentially the task of discipleship. Bobby Harrington and Bill Hull have come together to write a book called "Evangelism or Discipleship: Can They Effectively Work Together?" They maintain that discipleship cannot be done without evangelism. Evangelism cannot be effective without discipleship. They are not two programs or two ideas but ONE task! Bible studies are important. Prayer meetings are crucial. Church programs are needed. Yet, all of them for all the right intentions can be done with the wrong affections. Such wrong affections are Bible studies that point people more toward self-puffing up. If one thinks that going through a certain Bible is merely for the sake of entertainment or showing off one's completed checklist, such studies are mere information and data driven rather than formation and heart led. In prayer meetings, if requests and prayers are overwhelmingly inward looking, self-needs, and a total lack of care for others or for the mission field, that Church is but one that cares only for her own world, not the world of God. If Church programs are aimlessly headed toward mere filling up of the annual calendar, or just some interesting stuff to keep members satisfied, members consume much but grow little. Is there such a thing as a church on "maintenance mode?" Personally, I do not think so. In fact, this term is way too generous. I would rather call such churches on "life-support." Just like a raft on the river rapids, the waters are constantly gushing forward, pulling the raft along ending up at a giant waterfall. A Church that is not growing with new members will suffer from the attrition of the old members through dying or leaving. A Church that has no new leaders will try to sustain old works without new blood. They will lack new ideas and new initiatives to update and to keep the Church current and contextualized. A Church without discipleship is one that is not growing spiritually, not keeping herself fit, and not obeying God fully. A Church without sustained teaching will not be able to create opportunities for hearts to breakthrough when the Holy Spirit moves. A Church that so focused on inward looking programs will be like ostriches with heads in the sand. Such churches are not maintenance mode churches. Such churches are on life support. The first step to any recovery is to recognize the signs, and to start praying that God works through us. Once the heart is made willing, the steps will follow. It is this very first step that may very well be the hardest of all to take. Otherwise, be prepared to shut down, and move on. Let others who are more willing to do the will of God survive to spread the gospel of Christ. Those who are unwilling, maybe once the life support systems are removed, they will die a natural death.